Canning is a food preserving method in which the food is sealed in an airtight container. This method prevents spoilage and allows for food to be stored unrefrigerated for a longer period. To prevent food contamination prior and during the canning process a number of various methods are used: boiling, pasteurization, freezing, drying, vacuum sealing, as well as antimicrobial ingredients, such as salt, sugar, acids, etc. In the early years of the Napoleonic Wars, the French government offered a large cash reward to the inventor who could come up with a way of preserving large quantities of food. The large armies of the period required an increase in quality food, especially during the summer and fall months. In 1809, a French confectioner and brewer named Nicolas Appert developed a method of sealing food in glass jars and found the food did not spoil unless the seal was broken. It took another 50 years before it was understood why sealed food did not spoil, thanks to Louis Pasteur, inventor of the pasteurization method. Since glass jars were not easily transportable, commercial canneries replaced them with cylindrical tins or wrought-iron canisters, the name later being shortened to "can". 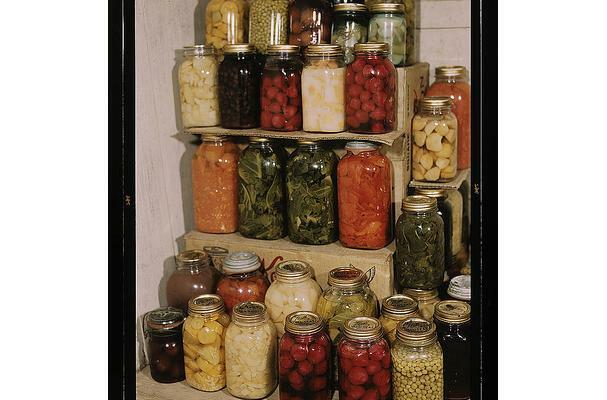 These proved to be cheaper and less breakable than glass, however glass continued to be preferred in home canning. The method used for canning (boiling water bath vs. pressure canning) is dictated by the acidity of the foods to be canned. Low acid foods require sterilization under high temperatures (240-275 F or 116-130 C) to avoid the Clostridium botulinum (botulism) microorganism, which can be done using the boiling method. High acidic foods, such as fruits, pickled vegetables, or foods that have had acid added, can be safely canned in a boiling water bath. To achieve temperatures greater than the boiling point, a pressure canner must be used. Most vegetables, meats, fish, poultry and dairy products require this method. In North America, the most common glass jar used in home canning is the Mason jar, which have thick walls. In the United Kingdom, Kilner jars are most used, which are similar to Mason jars but without the dimple on top.